Baldemar Rodríguez (1941 – 2015) was the seventh and second-longest serving Bishop President of the Apostolic Assembly. He was born in Santa Rosa, Texas, on February 4, 1941 to Luis and Soila Rodríguez. Raised in a family of musicians, he came to the Lord at the age of twenty when his father died of cancer in 1961. In 1965 he married our sister Homa Lee Candelaria. A charismatic preacher, the leadership soon saw great potential in him: He was quickly ordained, served as Sector Elder and later as Bishop Supervisor in the South Texas District (1971 – 1975) and Southeast Texas District (1975 – 1979). Later he would become Bishop Supervisor for the Interior District of California and Nevada for seven years (1987 – 1994). Bishop Rodríguez was a talented musician and hymn writer, composing many hymns like “Cuando Cristo me hallo” and “Quiero orar al Padre” in his Tejano style. His election in 1978 was a welcomed surprise by the pastors and people of the Apostolic Assembly. 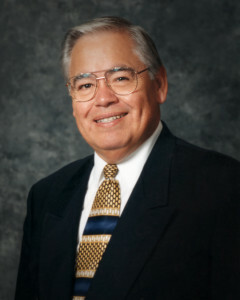 His first (1978) and last sermon (2002) at a General Convention was: “Run Church, Run!” Bishop Rodríguez’s leadership saw many districts established, the first General Conventions in Texas and New Mexico, and he expanded the Apostolic Assembly in numeric growth here in the United States and abroad. He graduated with a Master of Divinity (M. Div.) degree from Fuller Theological Seminary. The Lord called him to his presence on July 30, 2015 at the age of 74.